A new kitchen is meant to re-enforce ones taste, validate personal achievements and status, and offer physiological comfort. 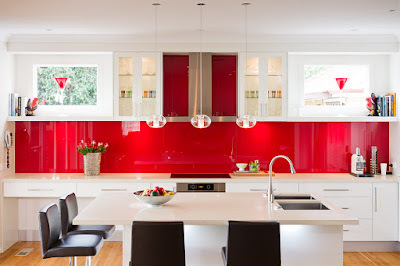 Renovation of the kitchen is an occasion for reinforcing ones happiness. The kitchen as a place and design process is as complex as any other part of our life. Things should be kept simple, but in order to achieve simplicity, the designer has to work closely with the clients to unfold the complexity of their requirements, draw essential ideas and apply them creatively into a new design. In the current family, Vicki’s passion for cooking and colour complemented the technical nature and attention to detail of Peter’s. Working with them stretched my knowledge and abilities, as they expected the new kitchen to be at the highest level of quality, function and design. They were both tired of the old kitchen made of dark wood, small cabinets with a constrictive “U” shape, hidden somewhere at the back of the ground floor. Working in the old kitchen felt more of a punishment than anything else. 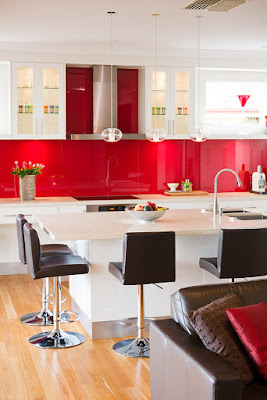 The kitchen lacked a useful bench-space, was cluttered, dark and too small for their large family. Image with the old kitchen of Vicki and Peter. Vicki wanted to have a new kitchen that is light in colour, airy, that will become the centre of the newly renovated wing, open to the living room and dining room and able to accommodate their large family and friends. 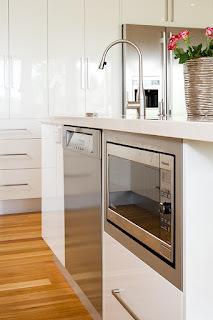 Hence, the oven and cook top were placed in the middle of the largest wall facing the living room and a step away, we created a massive island housing the sink and overhung on two sides. The new design, with the central position of the island allows the cook to interact either with the family seating in the living room or with the guests from the newly built deck. 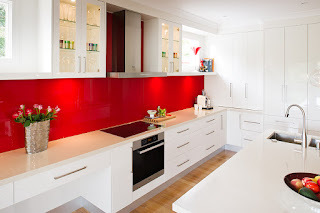 Vicki’s passion for colour was expressed through a burned red colour (X Factor of Resene) for a large splash back stretch on the whole 4.8 metre wall. 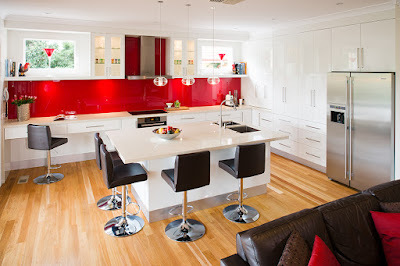 The red was, as expected, the peak of the colour scheme, otherwise composed of the reddish brown of the timber board, light buttery colour of the stone(Caesar stone-Buttermilk) and the soft Whispers White (of Dulux) high gloss of the cabinets. After a general layout and the final decision of the important features, it was Peter’s turn to complete the specifications with some fine touches and technical essentials: two undermounted bowls, a brushed aluminium kicker to bring a soft industrial look to the sleek cabinets, led lights under the bench for and excellent evening atmosphere and free of heat light source for people sitting on the bar stools, and low voltage halogens under and inside the wall units. Peter was aware of the importance of the kitchen investment and durability wise, thus he required up-to-date hardware of Hettich: soft closing steel drawers and V6+ runners (heavy duty), high steel walls for pot drawers, soft closing integrated hinges, Orga professional cutlery trays and anti slip mats, high quality folding doors Lazy Susan with chrome rail and melamine, pull out for spices, oils and vinegar. With equal contribution from both clients, with their early involvement in the planning process, the end design was sure to achieve the perfect balance between “looking good”, “feeling good” and “a working well kitchen”. It is good to feel stressed free from planning your kitchen renovation.